Weighty Matters: Is Health Canada About To Allow Wonder Bread To Market Itself As A Health Food? Is Health Canada About To Allow Wonder Bread To Market Itself As A Health Food? 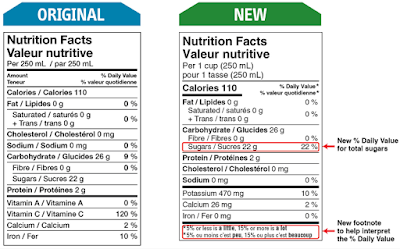 Last month Health Canada announced their finalized version of the changes Canadians can expect to see, 5 years from now, on our nutrition fact panels. 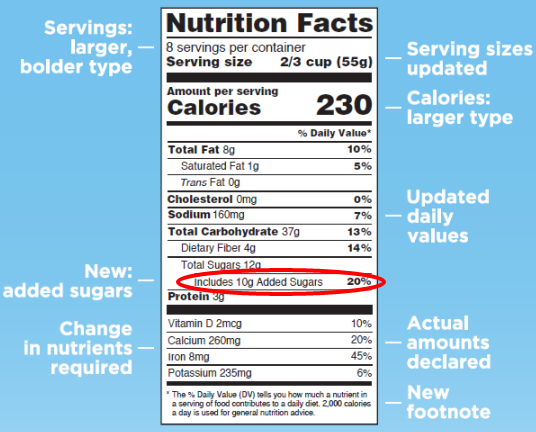 And while some of the changes are laudable, the changes to how our labels report sugar appear confusing. Rather than highlight the distinction between total sugars and added sugars, a distinction that the World Health Organization, Canada's Heart and Stroke Foundation, the American Heart Association, the American Academy of Pediatrics, the Institute of Medicine, and many other public health authorities believe to be the crucial distinction as would pertain to the impact of sugar on our development of chronic diet related diseases, Health Canada instead declined to add a line expressly highlighting a food's added sugar content. Instead, Health Canada elected to provide a line for total sugars, and to it attribute a %DV (percent daily value) measure derived from a recommendation of a total maximal daily limit of 100 grams of sugar (or 20% of total daily energy for a diet of 2,000 calories). In a consultation that I participated in at Health Canada, they explained to us that their rationale for not having an "added" or "free" sugar line was regulatory in nature. 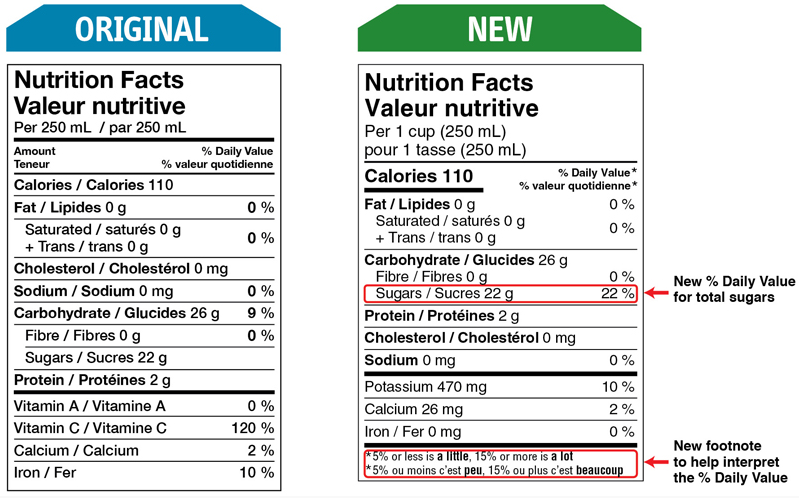 They reported that it would be impossible for Health Canada to include a line on added sugars because if there were a regulatory challenge, a laboratory would be unable to differentiate between a product's sugar source and would only be able to report total sugar and not the percentage of sugar added to said product. This strikes me as something of a cop out as not only do we currently have other labeling features that aren't testable in laboratory settings (Halal, Kosher, etc), but it is far from impossible to compare a product's total sugar and subtract that which would be expected to be intrinsic to a product's ingredients. It's also clearly not impossible as evidenced by the fact that America's Food and Drug Administration has announced that a line for added sugars will be rolled out to their nutrition fact panels (and required to be adopted in 2 years, rather than Health Canada's 5). As to why this matters, beyond stepping away from the recommendations of other jurisdictions and public health authorities, it's deceptive. For instance, if you were considering a 12oz can of Coca-Cola, if an added sugars %DV was set at 10% of total daily calories (as per pretty much everyone's recommendations), the can's label would tell you that it contained 78% of your recommended total daily value, but with Health Canada's new label, it'll tell you it contains a far less awful sounding 39% of your total daily sugar. "have no more than 5 grams sugars (a) per reference amount and per serving, (b) per 50 grams if the reference amount is small (i.e., 30 grams or 30 millilitres or less), or (c) per 100 grams if the food is a prepackaged meal." 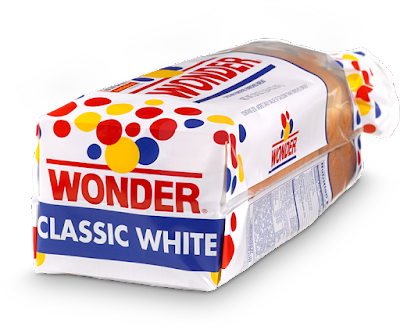 On that basis Wonder Bread would be allowed to promote itself as "low in sugars", and so too will scads of other ultra-processed foods. All this leaves me scratching my head and wondering whose interests are best served by these changes - the public, or industry?